"Karambit Use: Grips and Transitions"
Watching a skilled karambit player at work is similar to watching a talented dancer. The blade weaves, circles and darts in a way that's oftentimes hypnotic. It's breathtaking, captivating and difficult to look away from. Part of the allure comes from the movements of the user themselves, but quite a bit of it flows directly from the intricate motion of the karambit. Due to the karambit's unique design, an experienced karambit player can vary their grip on the blade and flow freely from one position to the next depending on the functionality required at the time. 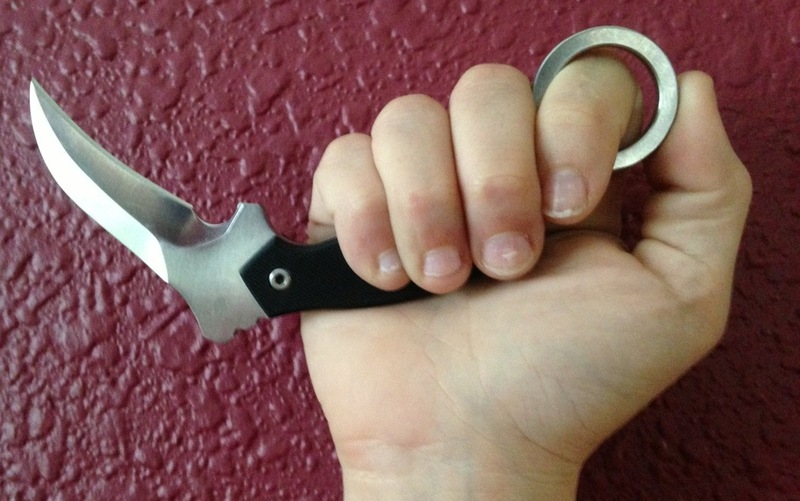 While it's easy for inexperienced people to scoff at and dismiss the karambit's various positions, grips and transitions as "showy," "parlor tricks" or "useless," in reality, the true potential of the karambit as an every day carry, utility, and tactical knife cannot be tapped without knowledge and understanding of the additional options and functionality that are inherent in a karambit's design. No other knife in the world offers the flexibility of a karambit. With a straight blade, there are two ways to hold it: in forward (or sak sak) and reverse (or pikal) grip. In contrast, when it comes to a karambit, there are three common grip choices, variations of each and specialty grips available. Each karambit grip has an optimal use and each one offers different degrees of grip security, reach, maneuverability, power and effectiveness for various applications. When trying to determine how to hold a karambit, carefully consider what you're using it for and what traits you need from your blade. What: Reverse grip is the most commonly seen, demonstrated and most widely recognized karambit grip. The majority of karambit users rely on reverse grip most of the time. 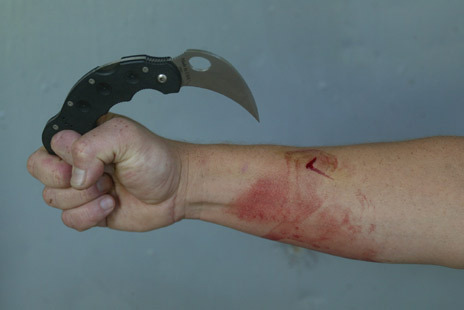 When: Reverse grip is best utilized in tactical and combative karambit applications. How: Position your right hand so it's palm-up and flat. Place the karambit on your palm with the spine facing your body, ring towards the right and the tip facing away from your body. Slide your index finger into the safety ring and close your fingers around the handle to secure the karambit in a reverse grip. 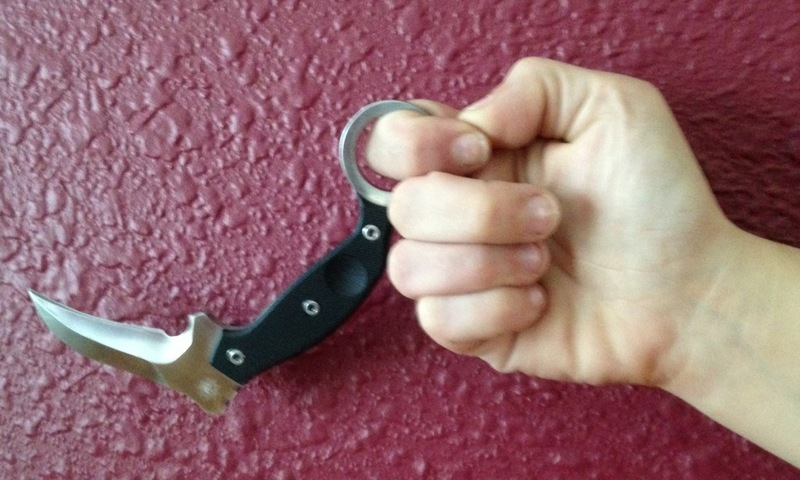 Variations: Keep the karambit in the same orientation, but vary the finger placed in the safety ring to gain more reach. The fewer fingers you have on the handle, the less stability and power you have. What: Forward grip is the second most common karambit grip. When: Forward grip is best utilized for chores, every day use, utilitarian function and tasks requiring exceptional control and precision. How: Position your hand so it's palm-up and flat. Place the karambit on your palm with the spine facing your body, ring towards the left and the tip facing away from your body. Slide your pinky into the safety ring and close your fingers around the handle to secure the karambit in forward grip. 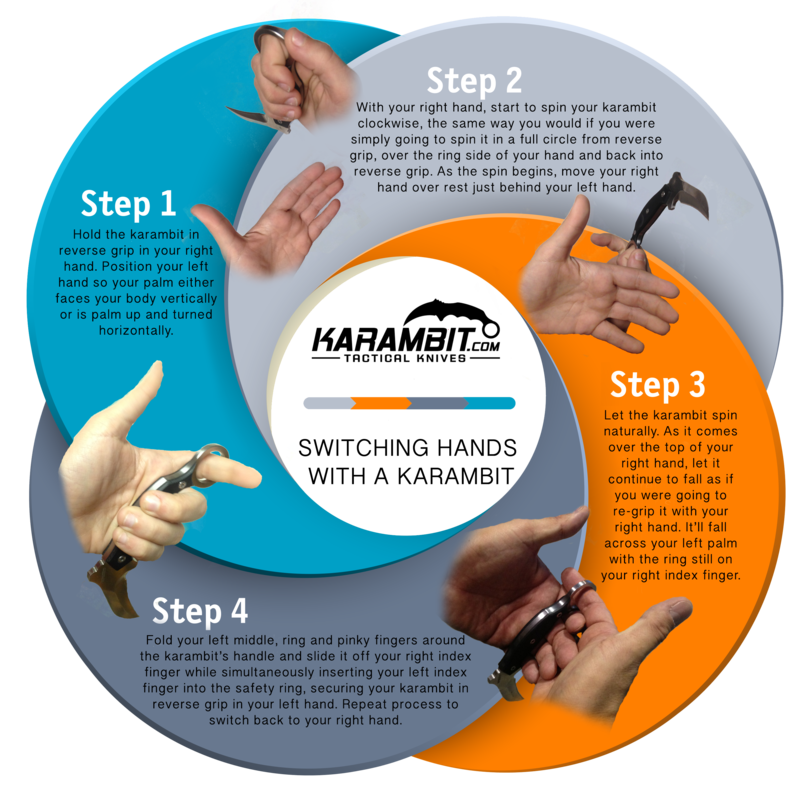 Variations: Instead of closing your thumb into a fist, place it on the back brake of the karambit to provide additional stability and to gain the ability to make precise cuts. Shift your hold on the karambit to the way you'd hold a pen during tasks requiring extremely fine motor control or careful attention to detail. What: Extended grip is the result of flipping a karambit held in reverse grip vertically in a counter-clockwise fashion so the blade lands across the back of the user's hand with the ring still secured on the index finger. When: Extended grip is rarely utilized as it has many shortcomings. However, it's useful in combat when extra reach is required or for leveraging upward application of force. During work, field or utility applications, it can be used to snag something that's just out of reach or that requires you to work from below the object. How: With your karambit held in a reverse grip, rotate the blade toward your body and over your index finger until it rests naturally against the backs of your fingers, blade tip up. Variations: Allow the blade to protrude through your fingers with one or two wrapped around the handle to provide additional stability. While there are only 3 commonly encountered ways to hold a karambit, there are several specialty or less frequently encountered karambit grips. Don't be surprised if you stumble upon unique or unfamiliar ways to hold a karambit, particularly if you study martial arts. There are many regional and system-specific karambit grip variations, some of which are closely held secrets. As long as a karambit grip is safe for the user and provides a functional use, it's not "wrong." The only "wrong" way to hold a karambit is the way that is dangerous for the one holding the knife. If you discover a grip we haven't covered, please contact us and let us know - we'd love to see it! Grip Basics: Similar to reverse grip, but the blade is oriented with the tip towards the user instead of away. 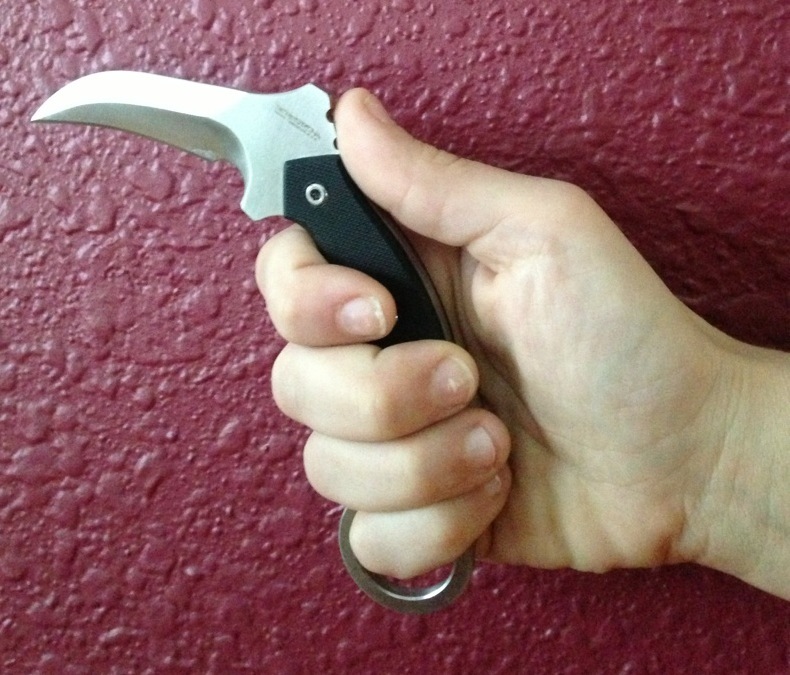 A karambit held in a mantis grip provides additional leverage for pulling and hooking movements towards the wielder's body and could be particularly useful in extremely close quarters combat. Our Thoughts: We understand and agree with the concept of additional leverage for force being pulled through something back towards the user. 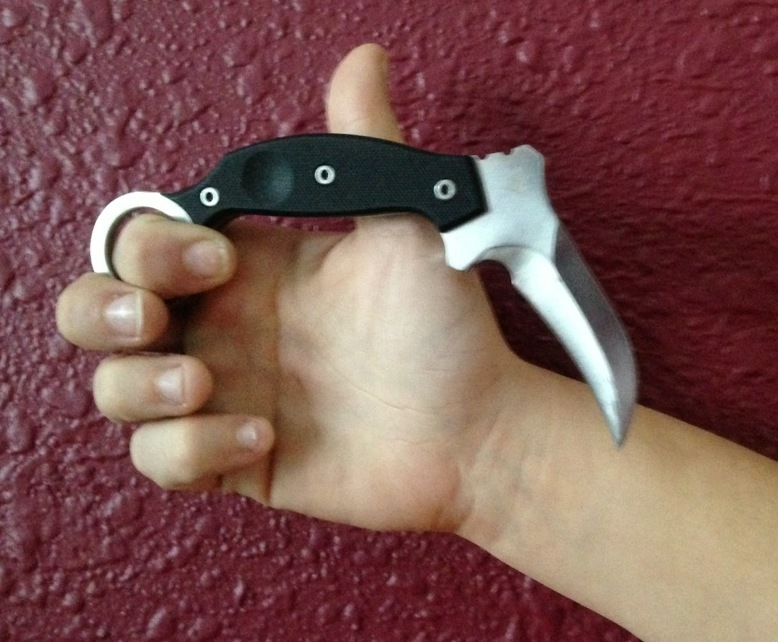 However, with the angle on many karambits, this grip could be dangerous as the tip rests close to the user's wrist. Apply with caution and only after much practice with a training blade. Part of appeal of a karambit is the ability to vary grips and reach targets a straight blade couldn't dream of without the user significantly altering their position. For example, inserting a straight blade into the back of something directly in front of the user requires shifting orientation from the front to the side or back of the object so the knife can be inserted into the target. In contrast, you can stand in front of an object and with a mere flick of the wrist, bury the karambit tip-first into the back of the target. Many people who are unfamiliar with karambit use dismiss karambit transitions, extensions and in-use motion as superfluous, pointless and showboating. 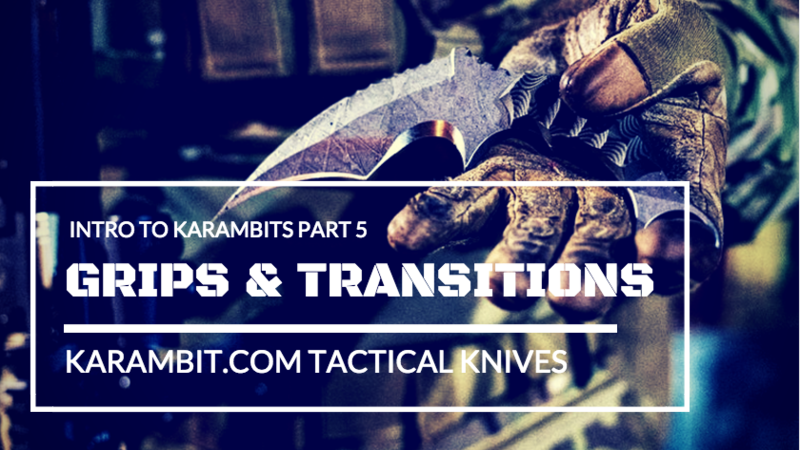 However, by refusing to acknowledge the benefits of karambit transitions, a user limits themselves to the functions available from a static blade. There are many transitions available and more variations than we could ever list. As a rule of thumb, though, any time a karambit is in motion in a user's hand with the express purpose of traveling from point A to point B without the user's hand or body also traveling from point A to B, a karambit is transitioning. All karambit transitions should be learned, demonstrated and practiced with a training karambit. If the blade of your trainer still "accidentally" contacts your hand, wrist or forearm at any point during transitions, you're not ready to practice with a live karambit. Karambit spinning is showy, flashy and useless without significant training, practice and understanding of the application. 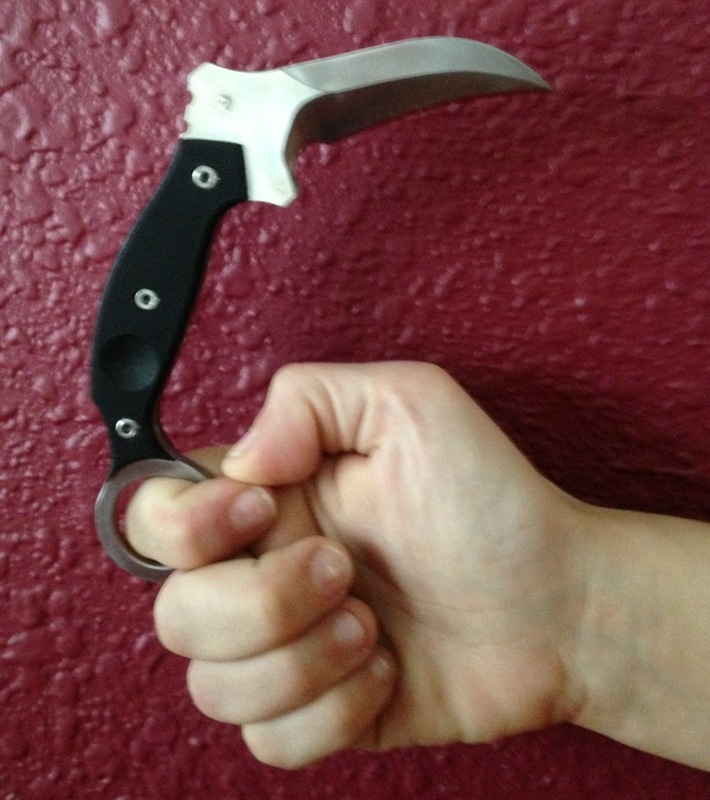 New users should not spin karambits until they're intimately familiar with their blade, its balance, the way it fits into their hand in various grips and while in motion AND, most importantly, until they've received instruction. For advanced karambit users, spinning should always be practiced with a training karambit until the user has developed their hand and forearm muscles enough to reliably spin the karambit trainer with precision and control. Being able to maintain control of the karambit throughout the entire spin in any direction (horizontal, vertical, forwards and backwards) is vital in order to perform this transition without injury. When learning to spin, you're not only fighting gravity, but you're also discovering truths about balance, weight, momentum and hand/forearm conditioning. Many people don't use the smaller muscles in the hands and it takes time to build them up. Spinning is used in combat to gain access to targets that would otherwise be out of reach and to allow devastating applications of leverage. For example, a user can spin a karambit into an attacker's torso and then simply pull the blade back into reverse grip. By simply relying on the blade's design, reach on extension and access to difficult-to-reach targets, the karambit user has doled out a potentially fight-ending blow in a way that straight blades can't replicate. While there are many advantages to using a karambit in combat or in tactical situations, the additional access to targets due to the blade's curve and the ability to move the knife without dropping it are two of the most significant. "But you can't switch hands with a karambit" is an oft-heard protest from those unfamiliar with this ancient Southeast Asian knife. However, not only can you switch hands with a karambit, it's a far more secure process than switching hands with a straight blade. 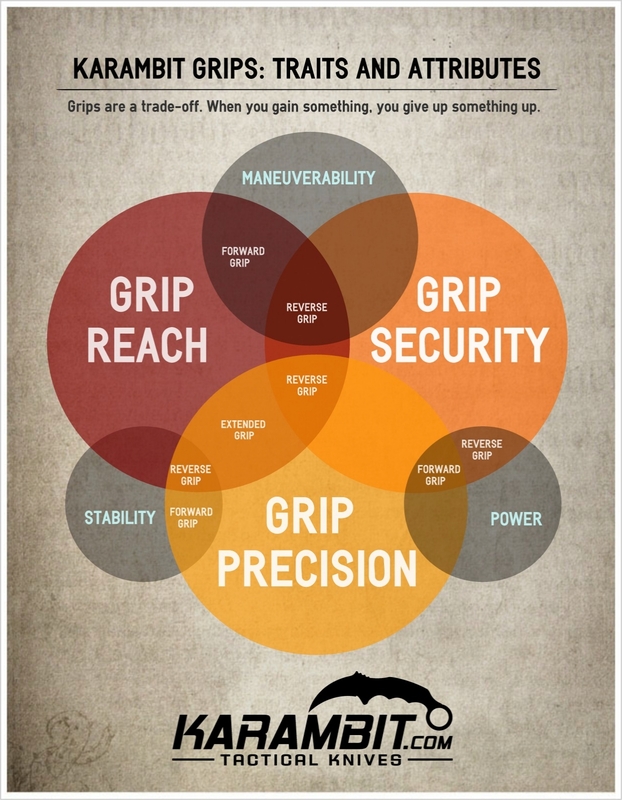 Each karambit grip offers unique advantages and there are pros and cons to each. Explore the various options and familiarize yourself with them. Don't only practice your grips and transitions after you've deployed your karambit, but also work on securing the proper grip and positioning during deployment. You may not always have time to adjust or rearrange your blade, especially if you're using your karambit in combat or other high-stress situations. Learn about the various carry options available for fixed and folding karambits and once you've found one that works for you, train yourself to deploy your karambit efficiently with a secure grip from the start, smooth draw and any transition necessary to end with your karambit knife in proper position for immediate use. Always respect your karambit, particularly when it's in motion. It's exceptionally sharp and packs a potent, unparalleled capacity to cause devastating damage. Don't ever forget your karambit has no awareness of its own. It will injure or cut anything its blade can reach, that fails to respect its space or that ignores its deadliness. Grant your trainers the same respect for your performance will reflect your practice. If you're sloppy with your trainers, you'll be sloppy with a live blade.